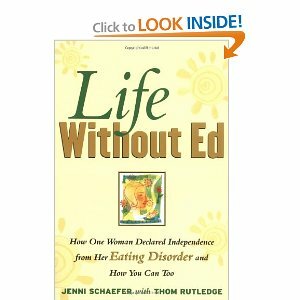 Book Review: "Life Without Ed"
Comments Off on Book Review: "Life Without Ed"
I believe that I have recommended the book, “Life Without Ed: How One Woman Declared Independence From Her Eating Disorder and How you Can Too” by Jenni Schaefer, more than any other since I have begun specializing in working with people struggling with disorder eating. Jenni Schaefer is in recovery from her own eating disorder, and she is now a great advocate for those who continue to struggle with their own treatment and recovery. It is written by herself, along with insight from the therapist who walked with her on this journey. It is honest, and so very insightful. Eating disorders do not make sense. Just ask anyone struggling with one or who is living along side someone with one. We need to eat to live, right? Why manipulate a necessity? They are so complex, involving societal, circumstantial, and physiological factors that are different for every single person. I meet with clients, and families of clients, who cannot make sense of what is happening. This book is gold in that it provides insight from the very depths of the struggle and gives hope for recovery. If you are struggling with an eating disorder, if you have a family member or loved one struggling, or you work in a field that may encounter these struggles, please buy this book. It is not a clinical book; it is this young woman’s story and it will captivate you.